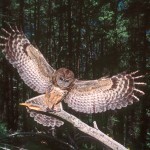 Owls have long been a part of folklore and legend. Often depicted prominently in popular culture, they rank on par with bats and spiders as the most celebrated of Halloween creatures. Owls appear as wise and noble characters in many children’s stories, including Winnie the Pooh, and Mrs. Frisby and the Rats of NIMH. Possibly the most famous owl, is Hedwig, the snowy owl in the Harry Potter series.